(Newser) – One of college football's most successful coaches has been placed on paid leave during the investigation of allegations that could result in his firing. Ohio State says it is looking into claims that Urban Meyer was aware in 2015 of domestic violence allegations involving former assistant coach Zach Smith, the New York Times reports. 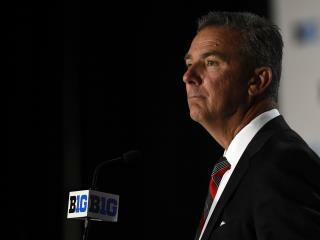 The university announced that Meyer had been placed on leave hours after former ESPN journalist Brett McMurphy published a report on Facebook alleging that Meyer's wife, Shelley, had known in 2015 about two domestic violence incidents involving Smith and his now ex-wife, Courtney Smith. McMurphy said his report was backed up by text messages.